Home > Vitamins & You > Do Cosmetics With Added Vitamins Work? 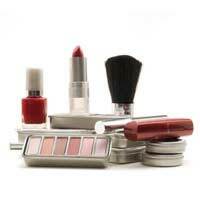 Some ingredients in cosmetic products are vitamins or are derived from vitamins. However, describing them as vitamins can be misleading, as many of these ingredients are not there to improve the health of the hair or skin, they are there for another reason – for example, to preserve the product, or as a moisturiser for skin or hair. The skin is the largest organ in the body, and one of its roles is to protect against substances entering the body from the environment. This means it is difficult for vitamins in cosmetics to enter beyond the top two or three layers of skin. Some compounds, such as those derived from vitamin A, or possibly vitamin C and E, do have an effect on these top layers. Hair is a protein filament, produced in hair follicles on the scalp. Hair is not made up of living cells, and so added vitamins in shampoos, conditioners and other hair treatments cannot make any difference to the basic health of the individual strands of hair, and cannot make any repairs, though they may change their external appearance. A form of vitamin A, known as tretinoin or retinoic acid, is used in creams for acne and sun damage treatment. Tretinoin is not absorbed at high levels but acts on the skin cells, stimulating the production of new skin cells, so improving the appearance of the surface of the skin. A provitamin is a compound that is converted to a vitamin in the body. Panthenol is the provitamin form of vitamin B5. It acts as a moisturiser, trapping moisture in the top layers of the skin, so that it feels softer and its surface appears smoother. Panthenol also plumps the skin so makes wrinkles and imperfections appear less apparent. Panthenol can also help in sunburn, mild burns and some mild skin problems. Vitamin C (ascorbic acid) and vitamin E (tocopherol) act as a natural preservative and this is one of the reasons why they are included in many skin creams and other cosmetic products. However, according to scientific studies, the antioxidants vitamin C and vitamin E applied to the skin may have some effect at protecting against the aging effects of free radicals. Free radicals damage the skin, and are produced naturally, but also when skin is exposed to sunlight or pollution, or as a result of smoking. However, few skin creams on the market have high enough levels of vitamin C and vitamin E to make any long term difference. It is also difficult to formulate a cream with sufficient vitamin C in it, as the vitamin is not very stable. Both vitamin C and vitamin E are not very well absorbed into the skin. Panthenol coats the surface of the hair and seals in moisture, making it appear shinier. Biotin (vitamin B7) is associated with prevention of hair loss, and this vitamin is often added to shampoos – however, it is not well absorbed through the skin, so may not have much of an effect.